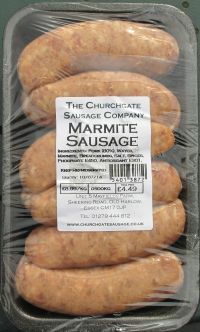 Jason of the Churchgate Sausage Company does make some really tasty sausages, so OK Jason, I'll go with you on this but avoiding any "sausageing about", I'm not keen on marmite on toast or whatever to be honest, I just don't like the taste. 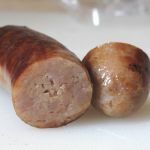 They cooked up really well (as normal for Churchgate sausages), browned nicely and the aroma from the pan was OK to be frank. The texture was quite close which gave for a good chew and the flavour, well, to me personally, as I thought, "yummy, hot salty gravy"...the others here however were much more complementary and really liked them. We tried these pan fried for the review and barbequed the remainder, with both methods producing a really good tasting result I'm told. Now come on, you really should try these at least once! 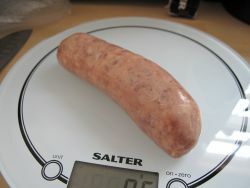 115x30mm before cooking, 110x30mm after. 85g before cooking, 76g after. That's a shrinkage of 4% & weight loss of approx 10%.